Poll: Will Steelers' Le'Veon Bell Play This Season? Poll: Will Le’Veon Bell Play This Season? The Le’Veon Bell watch continues. For months, it was expected that the Steelers star running back would report for work by Nov. 13, the deadline for him to sign his franchise tag and play in 2018. However, Bell’s camp only recently confirmed that the running back does not have to show up for work by Tuesday in order to solidify his status as a free agent for next season, which means that Bell could theoretically stay home for the entire season. Originally, it was believed the Steelers would have the right to franchise tag Bell again for the same rate as this season if he did not ink his tender by the deadline on Tuesday. As it turns out, the price of the third tag would actually jump to the quarterback level, which would cost upwards of $25MM. The transition tag would technically be in play, but the Steelers are very unlikely to match any offer and such a move would saddle the team with an unnecessary cap hold. All of this means that Bell can stay at home and preserve his health for free agency, though it would mean losing out on approximately $6MM in salary after already having forfeited $7.7M in game checks. 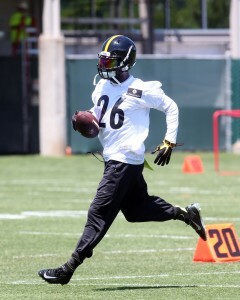 Some say that Bell should get back on the field to prove his commitment to football and reassert himself as one of the game’s best running backs, but the 26-year-old firmly believes that he’ll find a strong market for his services no matter what. Do you expect Bell to show up by Tuesday to face the Jaguars on Nov. 18? Or do you think Bell will extend his holdout through the end of the season? Click below to cast your vote (link for app users) and back up your choice in the comment section. This question to Steeler fans is the football equivalent of your kid in the back seat of your car asking “are we there yet?” every five minutes. It’s like having the kids gather expectantly in front of the fireplace at Christmas waiting for the arrival of Santa, then having to remind them that he might be too fat and out of shape to squeeze down the chimney. Would love to see Pittsburgh tag him again despite the price. Let Bell sit out of football for 2 years. You are exactly right slpdajab…As a Jets fan, I was salivating at the thought of him signing in New York in free agency. Now I want no part of him. Don’t overpay for Lamar Millerish!!! i agree Armaday. rather put that money to the o line and keep going with the rbs we have. So if he sits the season out, how does he expect to get more than the 15 Mil/5 the Steelers offered him? He wanted 18-20Mil annually, and even the Browns/Ravens/Bungles wouldn’t pay that much for him if he sits out a whole season. Let alone any team he’d actually like to play for. He gets “worst of both worlds” passed on the chance to be with the Steelers, gets similar money (OR LESS!!) somewhere else..
Bottom line: Bell better sign that tender by Tuesday and get some 2018 tape in, or he’s in bad situation come summer.